This Redpaper introduces the integration between two IBM products that you might like to consider when implementing a modern agile solution on your Z systems. The document briefly introduces Operational Decision Manager on z/OS and Machine learning on z/OS. 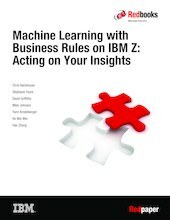 In the case of Machine Learning we focus on the aspect of real-time scoring models and how these can be used with Business Rules to give better decisions.